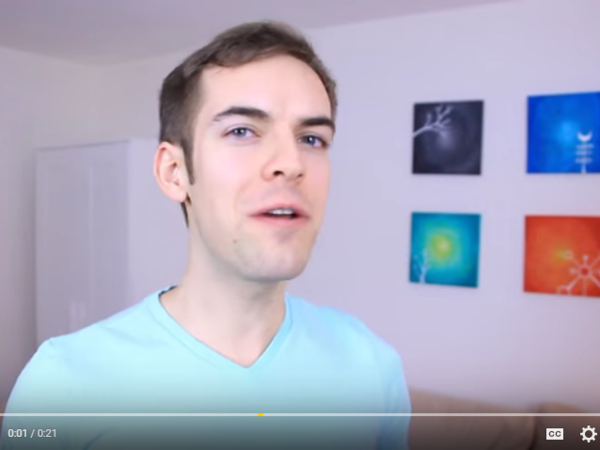 Jack Douglass says he lost thousands of dollars when his YouTube video was uploaded to Facebook. There's a battle brewing between Facebook and the people who make professional videos on YouTube. Facebook has made video a priority over the past year and many of the most popular videos turn out to have originated on YouTube. A lot of YouTube stars say Facebook is taking money right out of their pockets — and many of them are talking about big money. Back in 2007, YouTube launched a program that split the revenue for ads it ran alongside videos with the people who made them. Since then it's paid out over $1 billion to people like Jack Douglass, who began making comedy videos in college. "Years and millions of views later I am able to make a living," Douglass says. "And it wasn't always the case. It took forever. It wasn't really until 2010 or '11 that I was able to pay rent." YouTube says there are now tens of thousands of people like Douglass who make substantial money from their YouTube creations. Douglass does short satires of Internet culture. Earlier this year when everyone was trying to understand why some people saw a dress on the Internet as blue and black and others saw it as white and gold Douglass released a short spoof. The video got 1 million views in one day on Douglass' YouTube channel. And then, he says, "a very popular Facebook group also downloaded this video from my YouTube site and re-uploaded it on their Facebook page where they have millions of followers and in the first 24 hours that video on Facebook got 20 million views." Douglass says those 20 million views would have meant about $20,000 on YouTube. Instead, he made nothing. Douglass's agency — Fullscreen — contacted Facebook and the company took down the video. But the damage was done. No one was interested in that video on his YouTube channel anymore. "Because by then, by the time I uploaded it, it was done," he says. "Nobody was talking about the dress anymore. It came. It went. Boom! On to the next fad." Douglass is one of many YouTube creators who are angry about the reposting of their material on Facebook. According to Ogilvy and Tubular Labs, of the thousand most popular videos on Facebook 725 were re-uploads from other sources. Facebook would not talk directly to NPR. It pointed instead to a response to a critical blog post about its video system. In that response, Facebook says it takes intellectual property rights seriously and is trying to come up with a solution. Later this year, it's introducing a limited revenue-sharing program. YouTube took many years to develop its own revenue-sharing program. And it was easier because the videos are on a public site, says Andreas Goeldi, the chief technology officer at Pixability, which tracks online videos and advertising. He says the challenge with Facebook is that it's made up of private pages. "So in many cases there is this invisible content — you have no idea that people actually shared this stuff with other people," he says. Ultimately it is hard to hold Facebook responsible for the copyright infringement on its site, says Kit Walsh, a staff attorney with the Electronic Frontier Foundation, an online civil liberties group. There is a safe harbor protecting websites under copyright law. "An intermediary that accepts content from users is not responsible for copyright infringement that they commit," Walsh says. It's up to the creators of the content to let Facebook know if they find one of their videos, and then Facebook has to take it down. Because Facebook has invested heavily in video it's likely we'll be hearing more about this issue. In April the company claimed its users watch 4 billion videos a day. And if it wants the best videos to stay up on its site it will need to find a way to make peace with the people who create them. Facebook is in a fight with professional video producers. The producers put their material on YouTube, where they get a share of the ad revenue. Some of those videos get transferred to Facebook, where the producers do not get a share of the money - awkward. NPR's Laura Sydell reports. LAURA SYDELL, BYLINE: A lot of YouTube videos are, you have to admit, pretty silly. But creating them has become a serious business. Back in 2007, YouTube launched a program that split the ad revenue it ran alongside the videos with the people who made them. Since then, it's paid out over a billion dollars to people like Jack Douglass, who began making comedy videos in college. JACK DOUGLASS: Years and millions of views later, I am able to make a living. And it wasn't always the case. It took forever. It wasn't really until 2010 or '11 that I was able to pay rent. SYDELL: YouTube says there are now tens of thousands of people like Douglass who make substantial money from their YouTube creations. Douglass does short satires of Internet culture. Remember the dress that some people saw as blue and black and others saw as white and gold? DOUGLASS: But if you increase the saturation and fiddle around with the contrast, you can clearly see that the dress doesn't give a [expletive]. Thank you so much for ruining the Internet. You guys are the reason I drink. Good night. DOUGLASS: A very popular Facebook group also downloaded this video from my YouTube site and re-uploaded it on their Facebook page, where they have millions of followers. And in the first 24 hours, that video on Facebook got 20 million views. SYDELL: Douglass says those 20 million views would have meant about $20,000. Instead, he made nothing. Facebook doesn't have an ad revenue-sharing program. Douglass' agency, Fullscreen, contacted Facebook, and the company took down the video. But the damage was done. No one was interested in that video on Douglass' YouTube channel anymore. DOUGLASS: Because by then, by the time I uploaded it, it was done. Nobody was talking about the dress anymore. It came. It went. Boom, on to the next fad. SYDELL: Douglass is one of many YouTube creators who are angry about the reposting of their material on Facebook. According to Ogilvy and Tubular Labs, of the thousand most popular videos on Facebook, 725 were re-uploads taken from other sites, including YouTube. Facebook would not talk directly to NPR. It pointed me instead to a response to a critical blog post about its video system. In that response, Facebook says it takes intellectual property rights seriously, and it's trying to come up with a solution. Later this year, it's introducing a limited revenue-sharing program. YouTube took many years to develop its own program. And it was easier because the videos are on a public site, says Andreas Goeldi, the chief technology officer at Pixability, which tracks online videos and advertising. He says the challenge with Facebook is that it's made up of private pages. ANDREAS GOELDI: So in many cases, this is invisible content. You have no idea that people actually shared this stuff with other people. SYDELL: Ultimately, it is hard to hold Facebook responsible for the copyright infringement on its site, says Kit Walsh, a staff attorney with the Electronic Frontier Foundation, an online civil liberties group. There's a safe harbor protecting websites under copyright law. KIT WALSH: An intermediary that accepts content from users is not responsible for copyright infringement that they commit. SYDELL: It's up to the creators of the content to let Facebook know if they find one of their videos, and then Facebook has to take it down. Because Facebook has invested heavily in video, it's likely we'll be hearing more about this issue. In April, the company claimed its users watched 4 billion videos a day. And if it wants the best videos to stay up on its site, it will need to find a way to make peace with the people who create them. Laura Sydell, NPR News. Transcript provided by NPR, Copyright NPR.